We deployed the 24th seismometer at 9: this morning. The atmospheric pressure is dropping and the seas are rising, making the deployments more challenging. 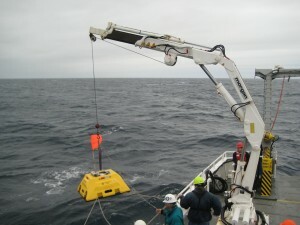 The roll of the ship increases the difficulty of both getting the seismometer to the rail and successfully releasing it over the side. We are heading back to Newport to pick up another anchor plate for one that we lost a couple of days ago. We’ll be doing a “touch and go”, without even putting out the gangplank. Fortunately, the last site is close to Newport. At 9:50, seven of us met in the wheelhouse for a live Skype broadcast to HMSC. Tracy Crews organized “Career Day” for high school students and we responded via two way video to student questions from the Hennings Auditorium. Our virtual presence was projected on its large screen. 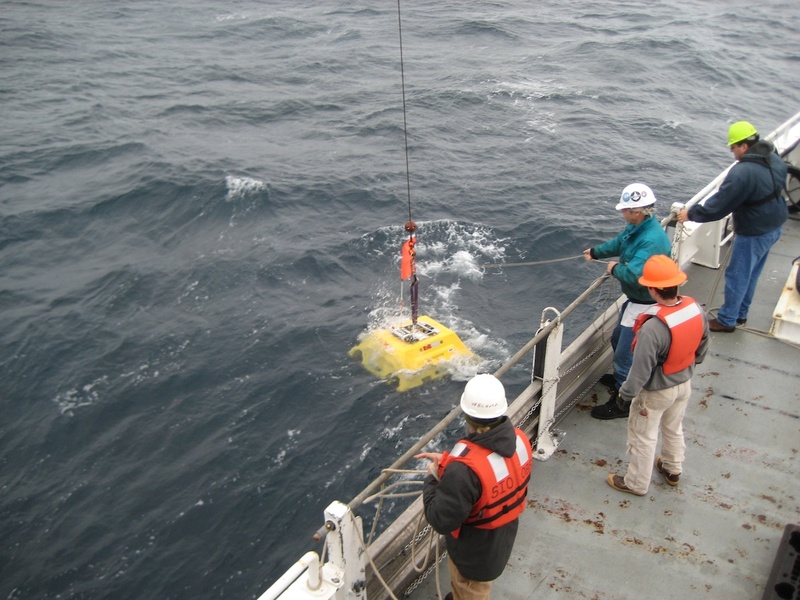 Bob Dziak – Chief Scientist – Professor, Marine Geophysics, OSU, – What are you studying out there? What’s it like working at sea? Dave Ogorman – Marine Instrumentation Engineer, Wecoma – How did you choose this career? David Gassier – Ocean Research Engineer, Lamont-Doherty Earth Observatory, Columbia University – What is your background? Is there a specialized degree in Ocean Engineering? Del Bohenstiehl – Co-chief Scientist – Associate Professor – North Carolina State University – What do you like most about being a scientist? Matt Fowler – Mooring and Instrumentation Engineer – Research Assistant, OSU – What is your background? What do you enjoy most about your job? Martin Rapa – Development Engineer, Scripps Institute of Oceanography – What did you have to consider when designing an underwater seismometer?